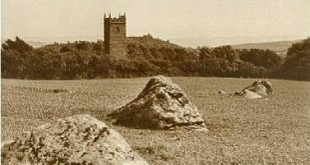 Whilst flicking through the archaeological news feeds today (24.10.09) one came up from Heritage Key (see link opposite) dramatically announcing: ‘Atlantis and Mini-Stonehenge found in Devon‘. As the term ‘Atlantis‘ was used I assumed whatever had been discovered was along the coastline somewhere – wrong! On reading further this over stated find was in fact at Tottiford Reservoir which lies on the eastern borders of the Dartmoor National Park. Although vastly sensationalised with such terms as ‘Atlantis‘ and ‘Mini-Stonehenge‘ this rediscovery will be a rare opportunity to see some prehistoric features that have remained unnoticed for 148 years. It is reported that the reservoir will be fully repleated in the Spring of 2009, once again consigning the features to its murky depths. Apparently: ‘Archaeologists observing the city are justifiably astounded at its existence‘. why? A cursory glance at the OS 1:25,000 map itself clearly shows a single hut circle less than a mile away from Tottiford and another small cluster at Christow Common so obviously the area was no stranger to the tread of prehistoric man. There are several archaeological records of field systems, finds and other hut circles in a 2km radius of the reservoir which also would suggest local activity. There are four main culprits that over the centuries can be blamed for the loss of archaeological remains on Dartmoor; agriculture, forestry, china clay extraction and reservoir building, all have destroyed and/or obscured such features, Tottiford Reservoir serves as an excellent example of this. So, considering the amount of rainfall recently I did not want to miss the opportunity of a field visit and see for myself before it all got submerged again. Sure enough, at the southern end of the reservoir are the remnants of a possible stone circle which I presume is the ‘Mini-Stonehenge‘ along with the burial cairns, something that looks very much like a hearth and wall remnants of an undeterminable age. If, as South West Water suggest this dramatic lowering of the water level in the reservoir is a commonplace occurrence it just seems amazing that these features had never been spotted before. As always such discoveries provide more questions than answers, such as, was this ceremonial centre associated with the settlement on nearby Christow Common? Are the wall remnants those of historic field systems or do they in fact date back to the Bronze Age? Does the discovery of Mesolithic flints suggest that the site was used over a period of 3,000 years? What lies under the burial cairns? The answers to these and many more questions can only be answered by a full archaeological investigation which I would imagine would be outside the budget of the Dartmoor National Park. So, there you have it, Atlantis it certainly isn’t, Mini-Stonehenge it’s definately not, a rare opportunity to see one of Dartmoor’s hidden gems it surely is. As each day goes by the water is slowly edging its way up the reservoir so if you would like to see for yourself what all the fuss is about I would suggest you visit soon. Should you wish to do so you can easily park by the reservoirs northern pier at OS grid reference SX 80730 83843.